A Taste of the Archipelago | What an Amazing World! It is easy to find Japanese, Italian, French, Middle Eastern, and even Thai restaurants in Jakarta, the capital and economic powerhouse of Indonesia and also home to 10 million people. However sometimes I wonder why it is not the case for Indonesian restaurants elsewhere in the world as its culinary selection is relatively less-known to most people outside the country. Its widely varying cultures might be one of the reasons as it is almost impossible to point out a handful of dishes to best represent the country. Earlier this year on several trips I managed to make time to sample some more local dishes from the places I went in Indonesia – mostly from Bali and the neighboring province of East Java. Like many other Indonesian dishes, some of the best-kept secrets that I tried looked rather unappealing to most eyes for their dark colors and uninspiring plating. But on the other hand a few others did look astoundingly beautiful, and most importantly tasted really good. 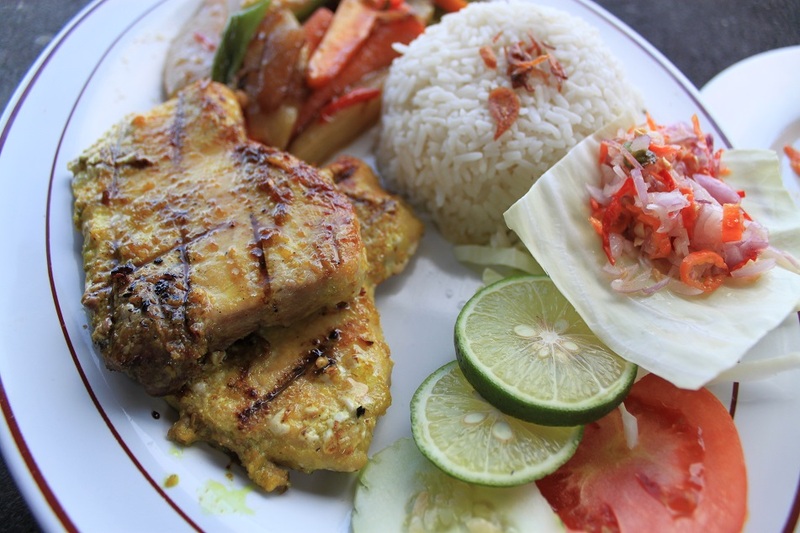 Nasi Campur is a hearty concoction of rice surrounded by various side dishes depending on the region. 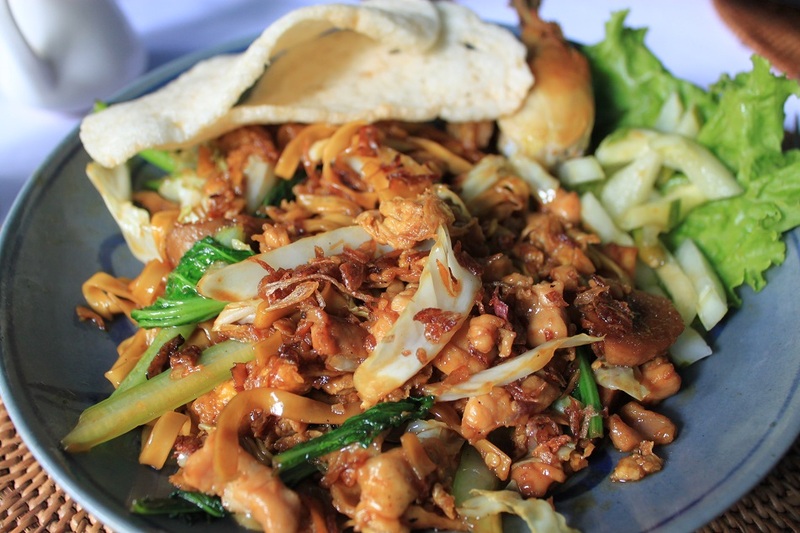 The one that I tried in Bali came with stir-fried tempe and peanuts, telur balado (boiled egg with chili sauce), sate lilit (grilled minced chicken on lemongrass), shredded chicken, fried tofu, and green vegetables. In other regions it is also called Nasi Rames which is widely available from fancy restaurants to streetside vendors. 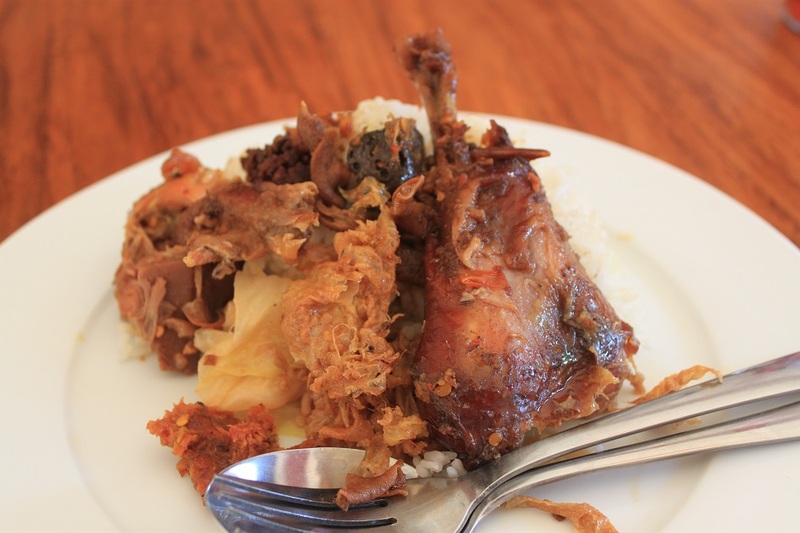 Ayam Betutu is one of my favorite Balinese dishes. As a matter of fact, each region in Bali has its own distinct way of preparing the dish, from steaming to roasting. The one that I tried in Ubud was the steamed version where a whole chicken was stuffed with spices and vegetables to make it taste rich and flavorful. Pak Sanur, the restaurant owner told us that he only provides chicken due to its cheaper price compared to duck so that regular Balinese can afford it. For a more adventurous taste and look, East Java’s Rawon is the one to look for. The blackish soup is usually served with bean sprouts, salted preserved duck egg, shrimp crackers and sambal. While many Indonesians love its rich and earthy flavor, some might not know that keluak – the seeds from which Rawon gets its dark color – is highly poisonous if not processed properly as it contains the deadly hydrogen cyanide. But fear not as all keluaks sold at markets are ready to use in cooking. In addition to that, shallot, garlic, ginger, candlenut, turmeric, red chili, beef stock and beef slices, lemongrass, galangal, bay leaves and kaffir lime leaves are also added during preparation. 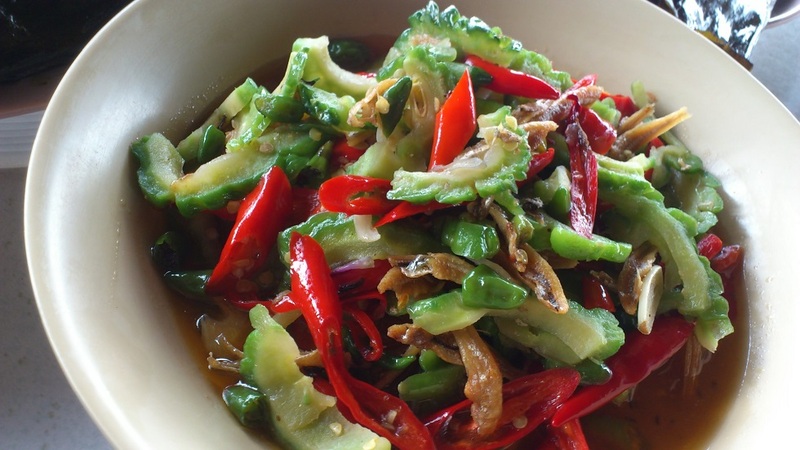 No gastro-adventure in Indonesia would be complete without a dose of sambal – ground chili with various spices used as condiment – which varies from one place to another. One of the latest sambals that I tried for the first time was Sambal Matah, literally raw sambal. Chopped shallot, garlic, red chili, shrimp paste, kaffir lime leaves, and lemongrass proved to be the ideal companion for the grilled fish that I had in Nusa Lembongan. Unlike most other sambals which emphasize on their strong flavor and unsparing kick of the chili, Sambal Matah is more on the light and fresh note. Bizarre, intriguing, spicy, rich, strong, bold, and fresh. 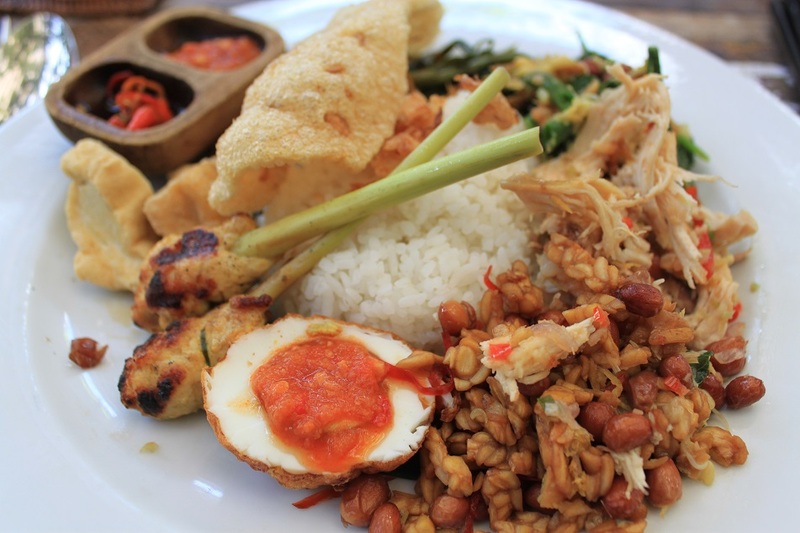 No matter how one describes Indonesian food, most find it very addictive. With more than 17,000 islands, the country sure has so many hidden culinary secrets to explore. Oh my word. 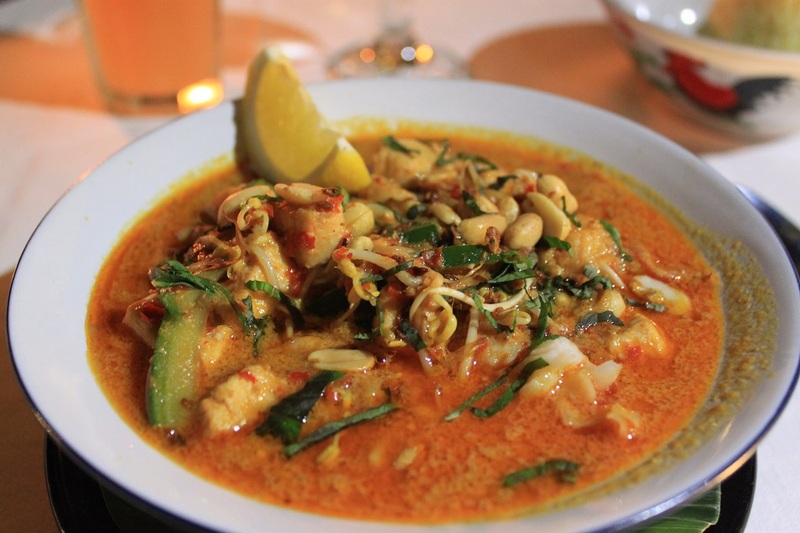 That food…The Kwetiau looks amazing! When I was choosing which photos to use in this post, my stomach growled several times! 🙂 They did taste great, Ada. Indonesian’s food are very delicious. I couldn’t agree more with you. Yet it is so underrated. This looks yummy. hope it tastes great as it looks!!! They were really delicious, indeed. Wow! 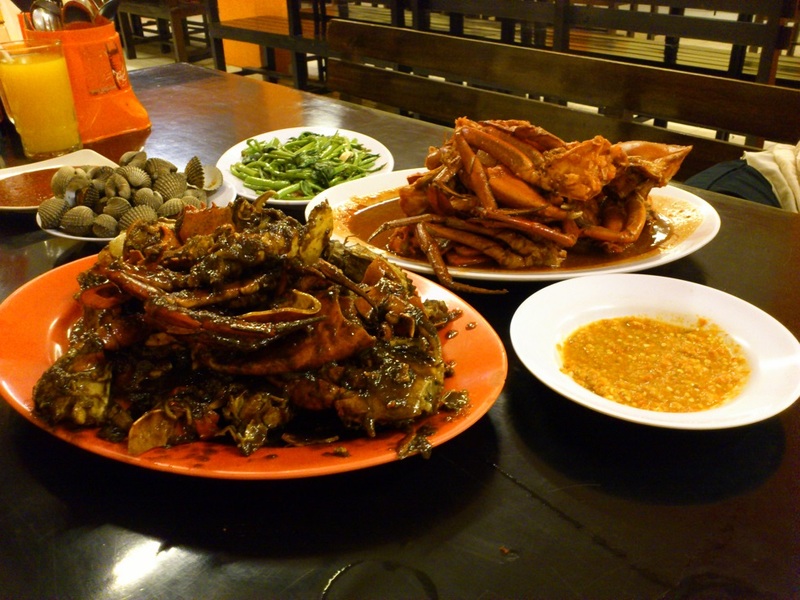 The food looks really intriguing especially the Kepiting Cak Gundul with Black Pepper and Padang-style Sauce and the shell-like things. What are they? I’m going to Indonesia next summer so I look forward to trying some of these menus out. I only hope we can find them…. Actually those are giant crabs, literally the biggest crab I’ve ever had in my life! Which part of the country will you explore, Victoria? I wish you an incredible journey in Indonesia next year! Wow! We will be going to Bali. I’ve been to Bali before but it was 14 years ago and my husband and son have never been to Asia at all so I’m looking forward to introducing them to the wonder and beauty of Indonesia. In order your husband and son not to be overwhelmed by the mass tourism, I suggest you to stay around Ubud or somewhere other than the southern part of the island. Wish you a very great time in Bali! And tastes amazing too! 🙂 Thanks for dropping by, Kathy! Maaf sudah membuat lapar. 🙂 Thank you! Hope you’ll try them yourself when you’re back to Indonesia one day. Makasih Ina! I started to like bitter melon only after my mom made a dish of it with small shrimps, julienned carrots, and red chili which when mixed together bring a nice sweet taste to the dish. Thanks for dropping by! I’m sorry and glad at the same time. 🙂 That Nasi Campur was indeed a nice one because it came with all those delicious side dishes. Your food posts never fail to impress Bama! You could make a career out of this 🙂 One more vote for the Ayam Betutu and Sambal Matah. Thanks a lot Madhu! I’m flattered. 🙂 I guess I’ll eat much more before I make a career out of food photography (should I ever choose to). 🙂 I guess more and more people are getting interested in trying Sambal Matah. I’m glad I did give it a try because it was so good and perfect to complement the freshly grilled fish. These photos are truly intriguing, Btw kepiting Cak Gundul ini dimana, Bama? Thanks Badai! Itu di Surabaya. Nama daerahnya lupa. 🙂 Itu kepitingnya ueeenaaaknya poll! Wow, this just became my new favorite post of yours, Bama (and there are some great contenders in that category, too!). I love how you chosen to focus on some of the dishes local to your home as opposed to simply following international culinary trends. These dishes looks incredibly appetizing, and you have beautifully photographed them, too! This, again, gives me that much more reason to finally embark on my oft-wished-for trip to Indonesia! Thanks Terri! I’m glad this post brings back some fond memories of your visit to Ubud. Actually this December I’m going back to Ubud and I won’t miss the chance to have another ayam betutu and nasi campur, along with other local dishes. I can imagine how fun it would be to take a cooking class which involves shopping all the ingredients at the local market. I assume you went to Ubud Market, didn’t you? Aah, I’ve been to Ubud Market twice and enjoyed every single visit. I guess there’s no better place to go to understand how the locals live than a traditional market. Hi David! Thanks for dropping by! I couldn’t agree more with you that Indonesian food is one of Asia’s most underrated cuisines. What Indonesian dishes have you tried so far? And what’s your favorite? I hope you’ll find some Indonesian food there, and if you do I hope it doesn’t cost you that much. I’ve heard that in Canada nasi goreng could cost you more than C$10! Bama, I don’t remember the names of most of the Indonesian dishes I’ve tried except for gado gado (my favorite), nasi goreng, and mie goreng. But I’m vegetarian and I’ve always found that Indonesian food has great vegetarian options. 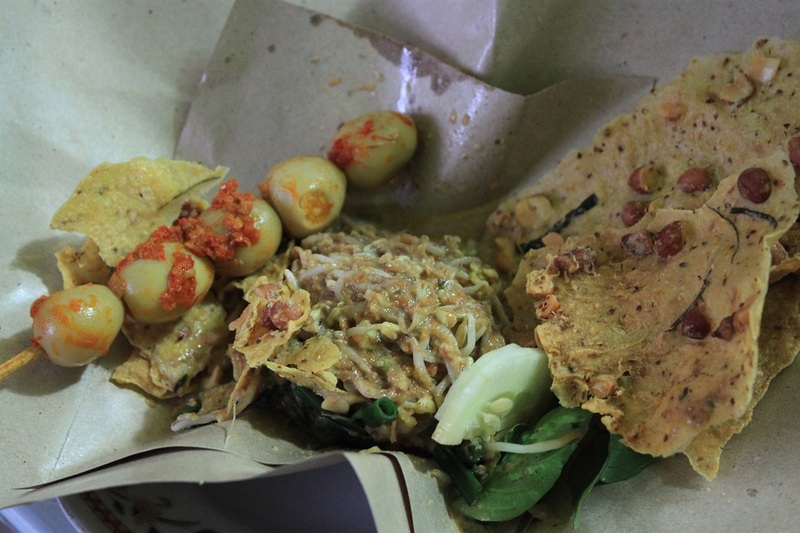 Most of the Indonesian food I’ve eaten was when I lived in East Timor, on trips I’ve taken to Indonesia (Bali and Java), and when I lived in Taiwan (there is a strong Indonesian presence there, and that’s where I had the best gado gado I’ve ever tasted). I have yet to find good Indonesia food here in the US. Sometimes you will find an Asian restaurant with mixed cuisine and they will have one or two Indonesian dishes, and there is a Malaysian restaurant near where I live, but it’s just not the same. I think I just need to get back to Indonesia soon. Thanks Mike! What was the spiciest food that you’ve ever tried so far? The thing is if you go to touristy places in Indonesia and order any spicy food, you will likely get a much toned-down spicy dish. Go where the locals go to taste the real one. 🙂 That preserved egg actually taste a bit salty and creamy. Very much to my liking. But not all Indonesians like it. I’m glad you enjoyed this post, Mike! Oh yes I should! 🙂 In fact I’ve been planning to write a post dedicated to those traditional snacks. Hi Bama, I just looked up if there’s any Indonesian restaurant in NYC. There’s actually one not too far from my office! It called Bali Nusa Indah. I have to drag some of my colleagues for lunch there one day this week. Oops, sorry! 🙂 Ayam betutunya wajib dicoba kalo pas lagi ke Ubud. Lol. 🙂 That only means one thing: it’s time for you to hit the road again and try those dishes yourself. Thanks Antoinette! These pictures bring back such good memories. We lived in Indonesia in the 90s, and in 20 years, I still haven’t come across a restaurant that makes Indonesian food the way I remember it. Thanks for the beautiful photos. I’m glad this post brings back some good memories to you. Were you in Jakarta during the height of the Asian financial crisis? In which part of the world do you live now? Apparently there has been quite a few Indonesian restaurants opening up around the world. But Indonesian cuisine is definitely underrated compared to other dishes from the region. We were in Jakarta from 1991. Then we moved back to Colorado and now we live in France. I haven’t found a good Indonesian resto in Paris yet. Do you know of one? We would love to bring show our daughters Indonesia. Wow. It looks weirdly rustic but delicious. So many options of cuisine. Ooops, sorry! Ternyata banyak yang kebetulan buka post ini pas lagi laper. 🙂 Buat saya paling dahsyat rawonnya karena biasanya saya gak terlalu nge-fans sama rawon, tapi yang saya coba itu enaknya poll!!! Looks delicious. I have to say that there aren’t that many Indonesian restaurants in Vancouver and Toronto where I’ve lived. 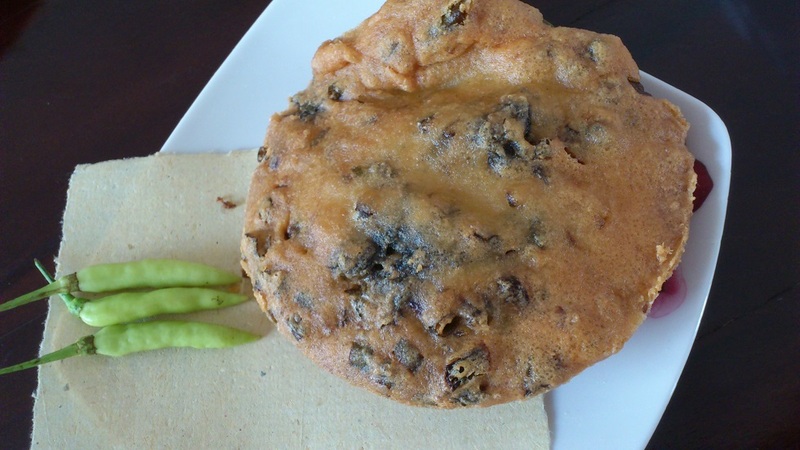 How would you characterize any differences between the cuisine of Bali vs. other Indonesian islands? 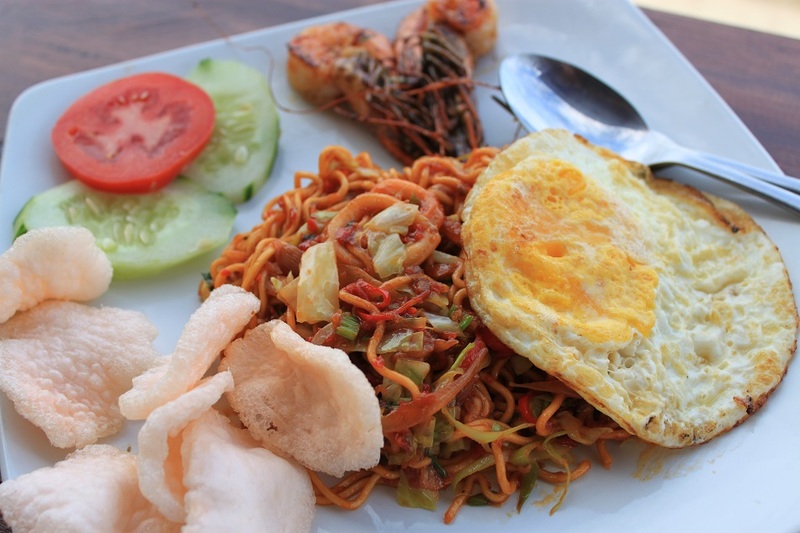 Since there are more than 17,000 islands, Indonesian dishes vary widely from one region to another. But to give you a perspective on how Balinese dishes are like, let me compare it with Javanese food, which I’m more used to. 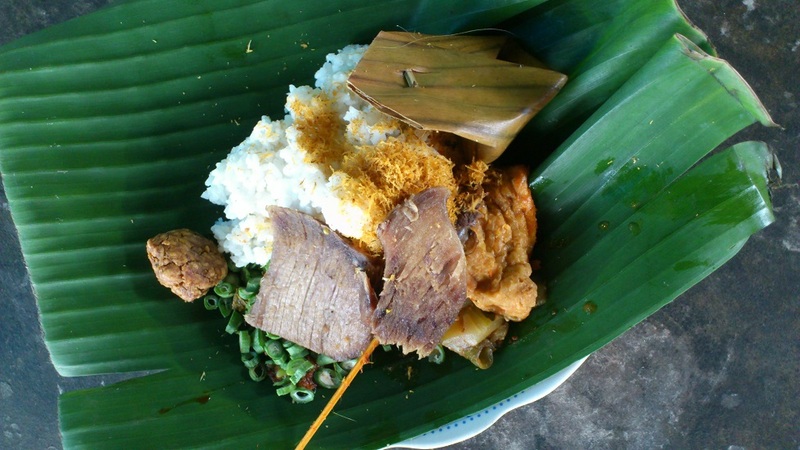 First, you’ll find pork in many Balinese dishes as opposed to the absence of it in Javanese cuisine. Then there’s sate lilit — Balinese version of sate (skewered meat) — which is usually made from minced fish wrapped around a lemongrass. Also you have sambal matah — Balinese version of sambal (ground chili and spices) — which is basically made from chopped shallot, chili, garlic, lime leaves and shrimp paste. The stir-fried bitter melon sounds really interesting–I’d love to know what it tasted like! Keep the exotic food photography coming!! If not cooked well the bitter melon would taste… bitter. 🙂 Cooking it with shrimps would help reduce the bitterness. 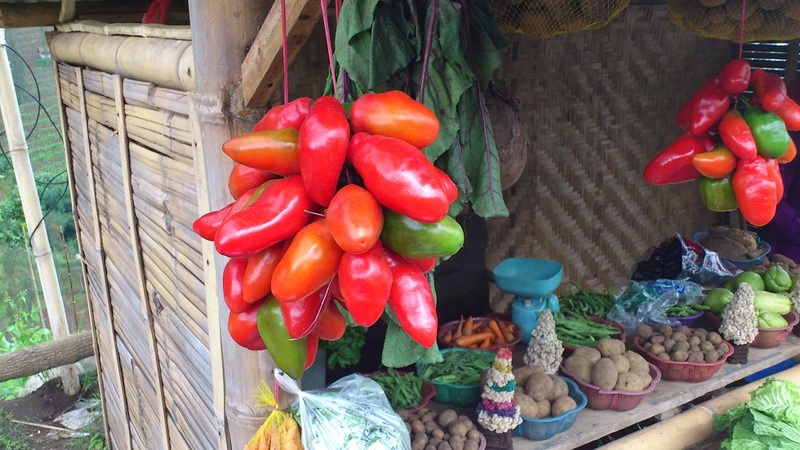 Your food photos from Costa Rica look so refreshing! When I get a chance to visit Central America I will make sure not to miss Costa Rica. btw i love all of those photos, nice shots! I love your photos as you feature those delicious food that I craved for. Thank you for sharing. 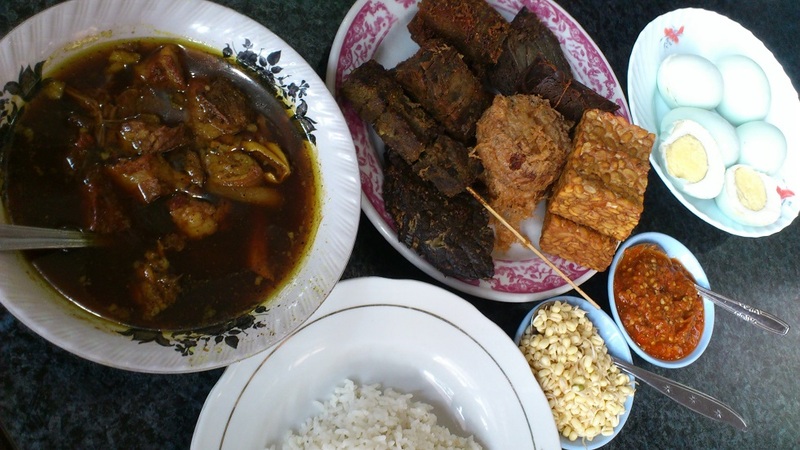 wow Indonesian foods are really delicious…I love those foods dude….!!! wow !! !